Many months ago I switched things up a bit and wrote about werefoxes, the werewolf’s “cousin,” and I hadn’t thought about until recently when a reader asked me why I hadn’t covered werebears as well. So thanks to that reader I am adding some more variety to the mix by giving you werewolf fans another shifter to fall in love with – the werebear. Unlike wolves, who have often been feared throughout history, the bear is an animal adored by many cultures throughout the ages, particularly the Northern folks, like the Finns. Here, the bear was worshiped in several Finnish pagan religions, which were huge long before Christianity. The early Finns viewed the bear as a higher being with supernatural powers, which descended from the sky (some would even point out the Great Bear in the stars as a place where the holy creature came from) and therefore worthy of worship. They also believed that the spirit of the bear resided in its skull and was called kallohonka. When a bear died, the spirit was thought to transfer itself from the skull and into something else, like a forest, a tree, a river, or even a person. The kallohonka would stay in such a place until it was ready to be reincarnated as another bear. If it entered the body of a human, that person might then take on the traits and behavior of a bear. In some areas, bear skulls were placed in high trees in the hopes that the kallohonka would protect the locals. In other areas, the bear was considered to be the physical manifestation of the sky god Ukko, who switched from an old man to a vicious beast. The bear was also like a totemic symbol is parts of Russia and among the Sami people (Lapland). It was believed that Sami shamans sometimes took on the attributes of the bear to ensure success in hunting. In order to do this, the shaman was “possessed” by the spirit of the bear and gained bear-like behavior and characteristics. There is also some evidence that bear cults existed among the Neanderthals (around 70,000 years ago). Neanderthal remains, coupled with bear caves found at Drachenloch (Dragon’s Cave) in Switzerland suggest this. Then there’s North America, who is rich in shapeshifting tales. Native Americans treasure the bear and address it often as “Grandfather.” One widespread Native belief is that the spirit of the bear never dies. It is also common tradition that Native American medicine priests adopt “bear” as part of their name. 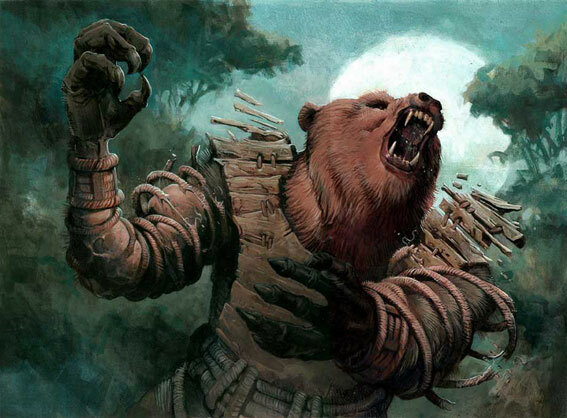 It’s also said that shapeshifting shamans often took the shape of a bear because of their powers. As for other stories of bear transformation, well, some are very similar to werewolf stories. Remember the stories about wolf-belts (or wolf-strap) – belts made of wolf fur that, when worn, would transform one into a wolf? Well, there are also stories of bear-belts that would also cause transformation. Also, just as the ancient Norsemen believed that donning the hide of a wolf would turn them into a wolf, they also believed that same for bear pelts. The supernatural beliefs surrounding the bear are incredibly vast and there’s absolutely no way I could cover every detail. However, I hope you enjoyed this small peek into the world of bear worship and werebears. As you can see, bear beliefs are very similar to wolf beliefs – bear-belts, shamans…etc. What do you guys think of these posts on other shifters? Let us know in a comment below.